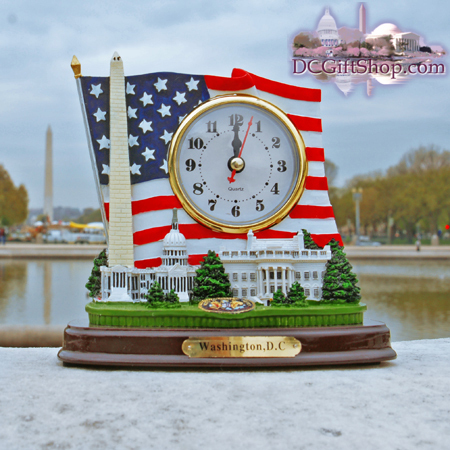 A great patriotic gift, this Washington DC souvenir clock features a quartz-movement timepiece set into a likeness of the American flag as a background. The base of the clock has the Washington Monument, the U.S. Capitol Building and the White House sitting upon it, all of which are rendered in 3-D. Spread out on the base are several pine trees to accentuate the monument and buildings. The 3-D base sits on a wood-colored platform with a copper colored plaque which says "Washington, DC" nailed to the platform. Constructed of plastic resin, this clock is 5.5 inches tall, 6 inches wide and 2.5 inches deep.